Management [Business Manager] – Jerome Leventhal, Leventhal Financial Services Corp. Published by Me & Chumba Music / E2 / EMI / Ainzworth Amil Music / E2 / EMI / Woodfella Muzic (ASCAP). Produced for Presidential Campaign. Recorded at Brandon's Way Recording, Los Angeles. Mixed at The TracKen Place, Hollywood, CA. Track 1 remixed for DaMo' Musik Works. Tracks 2 and 3 additional production and remix for HQ² Enterprises. Track 4 taken from her double-platinum debut album "Can't Take Me Home". ℗ 2000, 2002 & © 2002 Arista Records, Inc. Manufactured and distributed by Arista Records, Inc., a unit of BMG Entertainment. Printed in U.S.A. This single was originally promoted in 2000, but LaFace did not issue it as a commercial single. In 2002, BMG's labels (Arista, RCA, LaFace, Bad Boy, etc.) re-released a series of previously released singles under the 'Maximum Hits' series moniker. 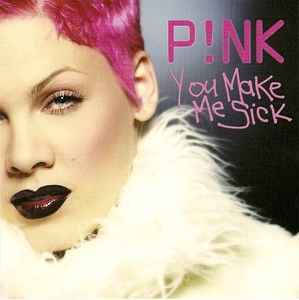 "You Make Me Sick" was among them, even though it had never been released commercially. These singles came with an insert featuring the other available singles in the series and a catalogue number for each release.